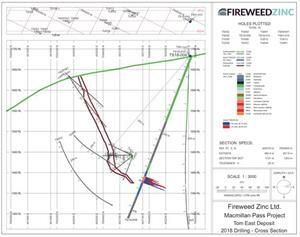 VANCOUVER, British Columbia, Sept. 20, 2018 (GLOBE NEWSWIRE) -- FIREWEED ZINC LTD. (“Fireweed” or the “Company”) (TSXV: FWZ) is pleased to announce the first drill results from its 2018 drill program on the Macmillan Pass Project in Yukon, Canada. This hole was drilled below the Tom East Zone to test the downdip extension of the resource. The zone remains open for further expansion. 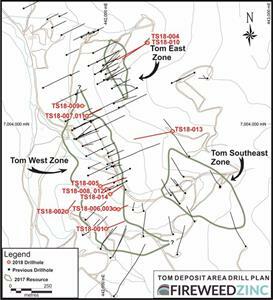 Drill hole TS18-004 intersected the Tom East zone approximately 50m down dip from the nearest known mineralized intersection. The drill hole intersected massive and laminated sulphide similar to feeder proximal mineralization encountered elsewhere in the Tom East and Tom West Zones. Sulphide minerals include sphalerite, galena, pyrite, and pyrrhotite and are hosted within diamictite and carbonaceous mudstones of the Macmillan Pass member of the Portrait Lake Formation (Earn Group). The structural complexities encountered in hole TS18-004 suggest that potential extensions to the Tom East zone may be folded, presenting an opportunity to drill-test areas of structural thickening or higher grades in hinge-zones of folds. Tom East remains open at depth and there is further upside potential in resolving the geometry of the fold hinge zone. *Structural complexity in the area makes true width estimates difficult without further drilling. The estimates in the table are based on core angles and known mineralization orientation respectively range from 5-12 m depending on structural interpretations. Assay results from additional drill holes are still pending as assays results have been slow in arriving due to generally large volumes of samples in the laboratories. As these first assays are received, the drill program at Macmillan Pass has now finished and field crews are now finishing up, winterizing the camp, and demobilizing for the season before winter conditions set it. The total meters drilled during the 2018 program were less than initially planned as management took a prudent budget-conscious approach to preserve cash given current market conditions and focused additional time on cost effective methods for targeting new discoveries on the large property including the field work described below. Maps, sections and a table of drill holes completed this year with notes on targets tested are attached to this news release and posted on www.FireweedZinc.com. During the 2018 season, a total of 5,497 meters of drilling was completed in 20 holes. This drilling comprised 2,965 meters in 11 (mainly step out) holes at Tom West, 748 meters in two holes (step out and infill) at Tom East, 678 meters in one step out hole at Jason South, 429 meters in four step out and confirmation holes at End Zone and 677 meters in two holes on new targets. 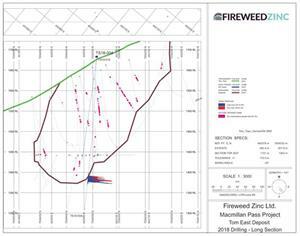 Field work began in early June (see Fireweed news release dated June 5, 2018) with geophysical surveying and geochemical sampling orientation grids in the Tom, Jason and End Zone areas to optimize exploration methodologies. This test work demonstrated that buried mineralization can be detected using a combination of conventional and new exploration technologies, guided by geological mapping and modern exploration concepts. The technologies determined to best detect zinc-lead-silver mineralization in the district are: geophysical surveying comprising ground gravity with passive seismics; and geochemical B/C horizon and soil gas hydrocarbon (SGH) soil sampling. Large gravity and soil sampling grids were completed and geological mapping was carried out in key areas. In total, 221.9 line kilometers of gravity surveying have been completed, covering approximately 45.5 km2, and 2,901 geochemical B/C horizon and 2,489 SGH soil samples have been submitted for analyses. Results received to date from the gravity, geochemistry and geological work are identifying new high priority drill targets with potential for new discoveries. Appendix to Fireweed Zinc news release dated September 2018. TS18-001 Tom West Step out hole at south end of Tom West Zone No zone intersected. Intersected fault where zone was projected*. TS18-002 Tom West Step out hole at south end of Tom West Zone Zone intersected. Samples submitted to laboratory. Assays pending. TS18-003 Tom West Step out hole at south end of Tom West Zone Short zone intersection truncated by fault*. Assays pending. TS18-005 Tom West Tom West infill to test zone of historic poor recovery. Zone intersected. Samples submitted to laboratory. Assays pending. TS18-006 Tom West Step out hole at south end of Tom West Zone No zone intersected. Intersected fault where zone was projected*. TS18-007 Tom West Infill hole at north end of Tom West Zone. Zone intersected. Samples submitted to laboratory. Assays pending. TS18-008 Tom West Tom West infill to test zone of historic poor recovery. Zone intersected. Samples submitted to laboratory. Assays pending. TS18-009 Tom West Step out hole at north end of Tom West Zone. Zone intersected. Samples submitted to laboratory. Assays pending. TS18-010 Tom East Infill hole in Tom East Zone Zone intersected. Samples submitted to laboratory. Assays pending. TS18-011 Tom West Infill hole at north end of Tom West Zone. Zone intersected. Samples submitted to laboratory. Assays pending. TS18-012 Tom West Tom West infill to test zone of historic poor recovery. Zone intersected. Samples submitted to laboratory. Assays pending. TS18-014 Tom West Infill hole at south end of Tom West Zone Zone intersected. Samples submitted to laboratory. Assays pending. EZ18-001 End Zone Infill hole to confirm historic drill results. Zone intersected. Samples submitted to laboratory. Assays pending. EZ18-002 End Zone Step out hole to extend End Zone. Zone intersected. Samples submitted to laboratory. Assays pending. EZ18-003 End Zone Step out hole to extend End Zone. Zone intersected. Samples submitted to laboratory. Assays pending. EZ18-004 End Zone Step out hole to extend End Zone. Zone intersected. Samples submitted to laboratory. Assays pending. (see www.FireweedZinc.com, Presentation, Slide 17). These 2018 drillholes will allow precise location of this fault in planning future drilling of the Tom West Zone on the other side of this fault.